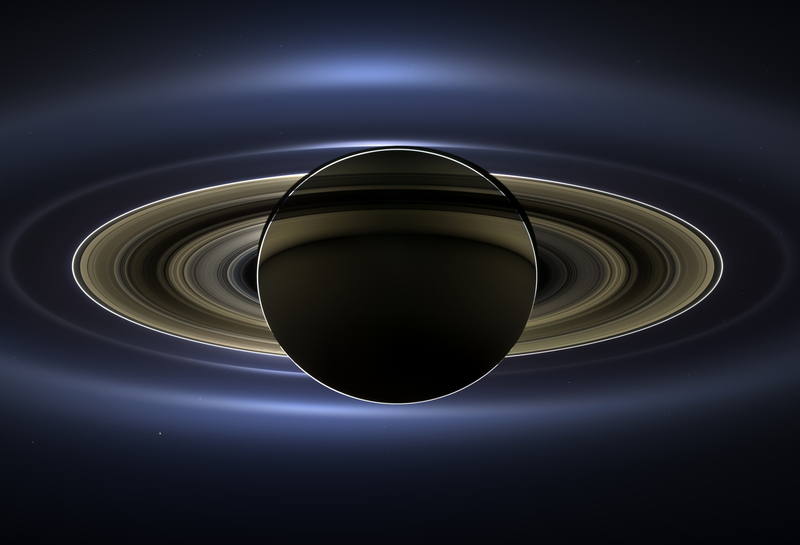 A spectacular panorama of the ringed planet Saturn, captured by NASA's Cassini spacecraft as it flew through the planet's shadow July 19, was unveiled Tuesday, showing Earth and its two sister planets, Mars and Venus, as star-like points of light nearly a billion miles away. The dramatic family portrait, a mosaic made up of 323 images shot over four hours by Cassini's wide- and narrow-angle cameras, also captures seven of Saturn's moons and the intricacies of its vast ring system as the spacecraft passed 746,000 miles behind the planet, in eclipse and out of the sun's glare. A close-up view of distant Earth was released earlier, but it took Cassini's imaging team until now to process the entire mosaic, adjusting brightness and contrast to highlight the dim, distant planets and to bring out features in Saturn's ring system. The resulting image spans 404,880 miles, including Saturn's entire outer E ring, made up of icy debris ejected from the south pole of the moon Enceladus. The mosaic was the brainchild of Carolyn Porco, leader of the spacecraft imaging team at the Space Science Institute in Boulder, Colo.
Porco launched a pair of contests inviting the public to submit music and photos that captured the moment of the cosmic encounter and urged people to step outside and wave at Saturn and Cassini. "In this one magnificent view, Cassini has delivered to us a universe of marvels, from spokes in Saturn's main rings to the spray erupting from the icy moon Enceladus, from the shadows of moons cast through the gorgeous blue E ring to the inner planets Venus, Mars, and our own planet Earth, far in the distance," Porco said in a NASA statement released Tuesday. "And it did so on a day people all over the world, in unison, smiled in celebration at the sheer joy of being alive on a pale blue dot." A similar mosaic captured by Cassini in 2006 also showed Earth. But the image was captured as part of a science campaign and it was not optimized to show Saturn in natural color and it did not include zoomed-in views of Earth. The Voyager 1 spacecraft imaged Earth from an even greater distance in 1990 as it neared the edge of the solar system. It was that picture that prompted astronomer and science popularizer Carl Sagan to dub Earth a "pale blue dot" in space.